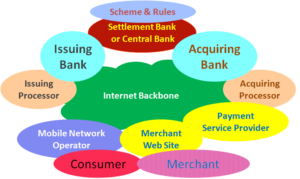 Mobile Banking – Simply a APP, Wallet or browser pointed to the Financial Institutions Online information. Must work has taken place since this note was started. Much has been done to automate, interface and assure interoperability in this place called the Internet. There is so much that has to be thought about as the other enabling features are implemented. SMS alerts where obvious first steps. Retention has to be built in as an objective of most implementation or there is a crash and burn. Know your customer becomes a marketable service. Two and three factor authentication becomes practical. Mobile Loyalty – The sticky factor – Check In not Check Out. Stakeholders are the challenge – mobile network operators, carriers, hand set distributors and manufactures, financial institutions, banks, merchants, ISOs, processors, agents … . The business case, like so many others, is dependent on consumer uptake. Mobile phone user, embrace; as long as costs are affordable, convenience and intuition is built in. Interface must be user friendly, input is intuitive and control and setup, is effortless.